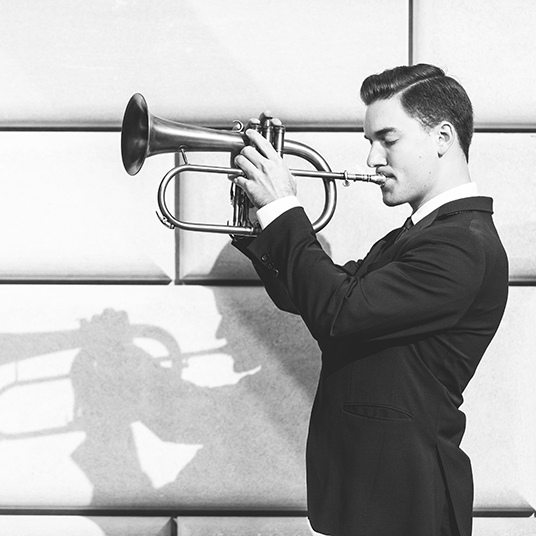 Jonathan Dely, 25, is an award-winning trumpet soloist from Long Island, New York. Named a finalist in the International Trumpet Guild Jazz Competition, the National Trumpet Competition, and the Yamaha Performing Artist Competition, Jonathan graduated with latin honors from Williams College, where he served as the college’s teaching assistant in jazz and upon graduation was awarded the prestigious Arthur Judson Prize in music. During his senior year in college, Jonathan declined a full-time investment banking position on Wall Street, where he worked the summer prior, in order to pursue his dream of becoming a solo trumpet artist. Shortly thereafter, he applied and was accepted on scholarship to the graduate program in jazz trumpet performance at the Manhattan School of Music, where he would earn his Masters degree in 2017.